The Indiana House is expected to vote soon on Senate Bill 101, Indiana’s proposed ‘Religious Freedom Restoration Act’, which the Indiana Senate has already passed 40-10. By a similar margin, the Senate also passed SB 127, which will allow any group receiving state or local contracts to discriminate against individuals who do not espouse its religious tenets. Momentum continues in this session of the Indiana General Assembly to pass “religious freedom” legislation. · Will these bills lead to the firing or non-hiring of Muslims and other minorities by private hospitals, colleges and universities, schools, and other religiously-affiliated groups? · Will they limit the religious freedom of the employees or enhance the religious freedom of employers? Could they pose any threat to thousands of Muslim Hoosiers? On the other hand, there is much less attention to the need for Indiana to enact a hate crimes statute, which has also been proposed again in this session as House Bill 1330. · What is the likelihood that HB 1330 will be enacted? How will it help reduce the climate of bias against minorities and make hateful criminals think twice? · Will it protect Muslim Hoosiers against hate crimes based on Islamophobia by ensuring they are swiftly prosecuted? 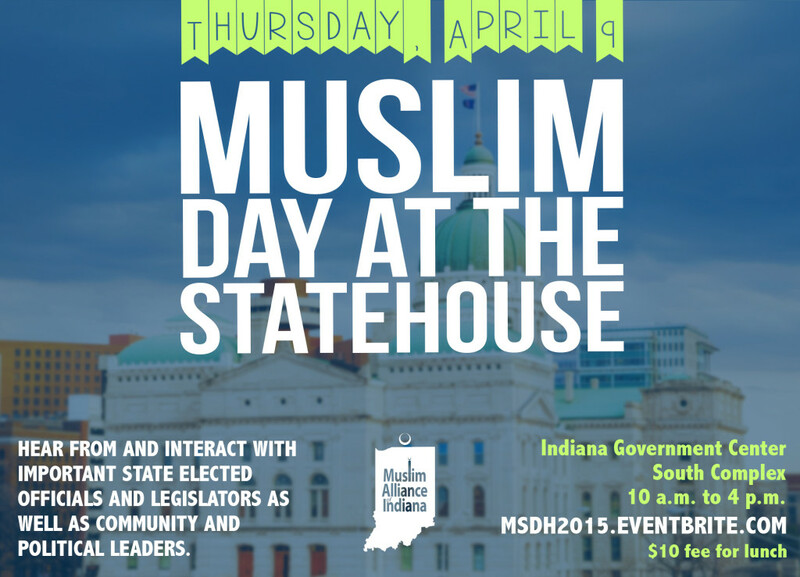 On behalf of the Muslim Alliance of Indiana (MAI) and the Council of Indiana Muslim Organizations (CIMO), we are pleased to invite you and leaders in your local community to the second annual Muslim Day @the Indiana State House (MDSH) on Thursday, 9th April 2015 from 10.00 AM to 4:00 PM. The event will take place at the Indiana Government Center – South Complex in Indianapolis. Lunch will be included in the registration charge of $10. Come to the Muslim Day @the Indiana State House to learn about the possible consequences of these pieces of legislation. • AMPLIFY Muslim efforts in political engagement, community service, and social justice. Several Indiana elected officials and legislators, as well as some well-established political leaders, will be meeting with us. Your participation in MDSH 2015 is important. We pray that your community will be fully represented at this important event. Please register TODAY at mdsh2015.eventbrite.com. Over the years a number of mosques and Islamic organizations in Indiana have organize activities on and around Dr. Martin Luther King Day of Service. The Muslim Alliance of Indiana (MAI) and Council of Indiana Muslim Organizations (CIMO) encourages Muslim Hoosiers to engage in community service to not only commemorate the day, but to help grow in civic engagement throughout the year. Thanks to Br. Fady Qaddoura for this information. The Indiana Civil Rights Commission had compiled a list of events and activities in Indiana on its website. This list has NOT been updated for 2015. However, the statewide phone and email contacts that are listed here may be helpful for CIMO members to get connected and participate in activities that are being organized. Please do not assume that the activities and dates given here are valid for 2015. The Muslim Alliance of Indiana (MAI) and CIMO would like to share plans, opportunities, and ideas for service events for the weekend of January 16-19, 2015. Below are some Muslim Hoosier activities for January 2015 MLK Day of Service, known to MAI at this time. 4- Several other masajid are working on plans, which we will share as information becomes available. This is just a sample of possibilities and planned activities. Please reply to Carey Craig at MAI ([email protected]) and let us know as soon as possible about your plans, which we will share for the benefit of others. (Indianapolis, IN, 1/19/15) On Wednesday, January 21st, a group of Muslims and people of many faiths in Indianapolis are planning to hold a rally in support of freedom of expression, universal education, and religious liberty. The event will take place at the IUPUI Democracy Plaza. People of all faiths are warmly welcome to join in conversation, prayer, and solidarity. Parking is available in visitor parking garages on campus. The recent horrific spate of terrorist murders in Nigeria, France and elsewhere claimed in the name of Islam contradicts its teachings on universal education and freedom. The Quran’s first revelation is a call to ‘read’, as ‘your Lord .. taught with the pen.’ The Prophet Muhammad said that “seeking knowledge is incumbent upon every Muslim, male and female”, and, by some reports, said “seek knowledge, even unto China”, referring to secular knowledge. He arranged for non-Muslim prisoners to earn their freedom by teaching Muslim children to read and write. For centuries, Muslims have sought the sciences of all other civilizations and built upon them. Boko Haram and the Taliban have cast themselves out of this endeavor, but will never thwart it. The Prophet of Islam was continually mocked and often assaulted during his years of preaching. He endured these personal attacks and taught his followers to forgive, flee if necessary, and to make peace. He prayed for and worked for people’s welfare, even that of his assailants, and taught his followers to not mock the symbols of other faiths. The criminals who have murdered or threatened writers, journalists, and cartoonists in Europe and elsewhere have utterly abandoned the gentle example of the Prophet. The power of education, scholarship, and free expression has been immensely valued in Islamic civilization, recognizing that the pen is ultimately mightier than weapons of violence. There is absolutely no justification in Islam for the killing of Charlie Hebdo cartoonists and Jewish shoppers in France, schoolchildren in Pakistan, worshippers in Jerusalem, or innocent people of all faiths in Nigeria and other nations. While denouncing terrorism, the rally is intended to reinforce support of sanctity of life, freedom of expression, universal education, and religious liberty. These are positive values that Muslims not only share with all humanity, but indeed helped to take shape over the centuries. The rally was conceived by a group of Indianapolis-area Muslims and is co-sponsored by a growing list of local organizations: Butler University Muslim Student Association, Council of Indiana Muslim Organizations, Indianapolis Muslim Community Association, Indianapolis Peace and Justice Center, IQRA Center of Indiana, Islamic Society of North America, IUPUI Local Global Peace Network, IUPUI Muslim Student Association, Masjid Al Fajr, Masjid Al-Mu’mineen, Muslim Alliance of Indiana, Muslim Volunteers of America, Nur-AllahIslamic Center, Rise for America, Veterans for Peace.